I promised to bring you this recipe in another post. The filling in these enchiladas came from the jackfruit tacos with a slight modification. If you have not noticed I like to make multiple meals from a base of another meal. I guess you could call it batch cooking, big cooking, whatever you want to call it it makes your life a whole lot easier. A good word for it is transformation cooking. Transformation cooking lets you make multiple meals with just a few tweaks to make it different enough that you do not feel like you are eating the same thing over and over. You are stretching your $$$ by not having to by lots of ingredients. This works really well when you keep your pantry stocked with basics (when they come on sale).Now it is time to transform those tacos into enchiladas. Combine jackfruit taco filling with 1/2 of the vegan cheese shreds and stir. Pour in a shallow dish half of the tomato sauce and half the Smokey Southwestern Seasoning and stir. Dip corn tortilla into enchilada sauce. Spoon 2 heaping tablespoons of the jackfruit filling into the tortilla and roll it into a tube. Place into a rectangular baking dish. Repeat. Pour remaining sauce over enchiladas. Sprinkles Smokey Southwestern Seasoning over sauce. 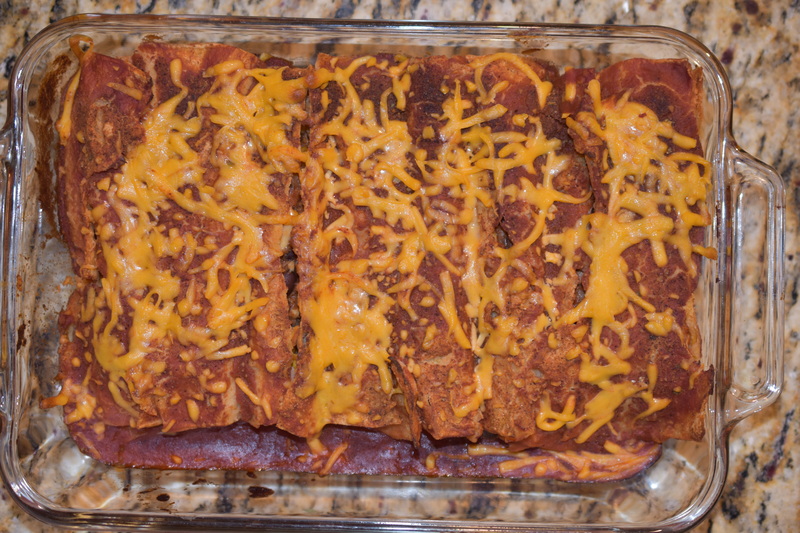 Sprinkle remaining vegan cheese shreds over enchiladas. Bake until hot a bubbly, about 20-25 minutes. Note: I assembled this the right after we ate our tacos and was doing clean up. I covered with plastic wrap and put it into the refrigerator for the next evening to bake. By taking 10 minutes extra during the clean up time you save a whole lot more the next night. Serve with a side salad and you have your next meal in 30 minutes or less. Thank you. Another hit the house.